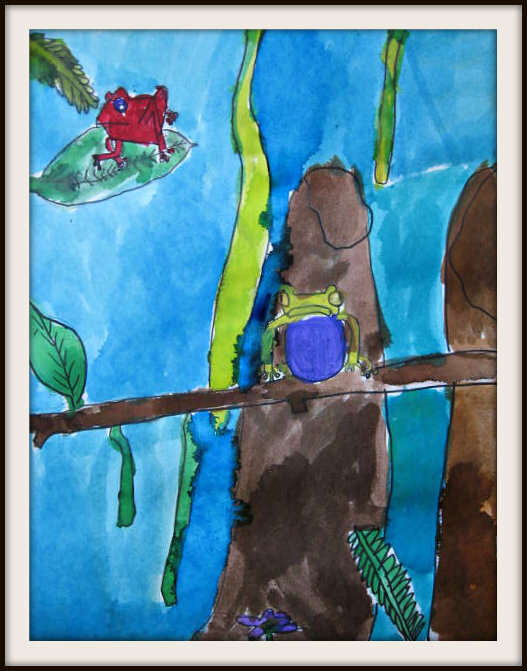 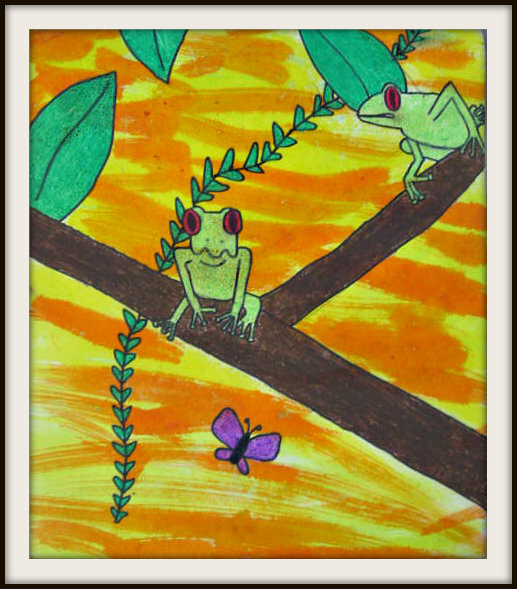 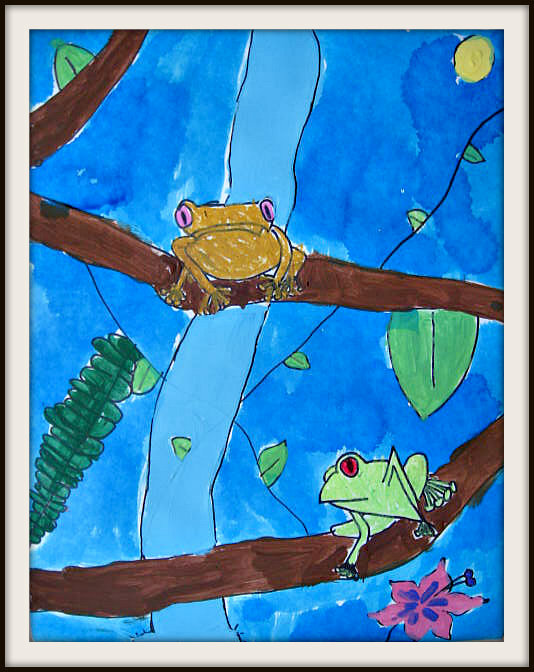 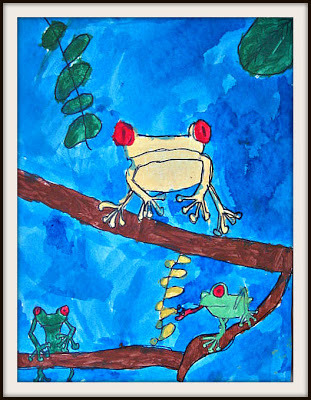 My K-4th students looked at both Red Eyed Tree Frogs and Poison Dart Frogs from the rain forests of South America. 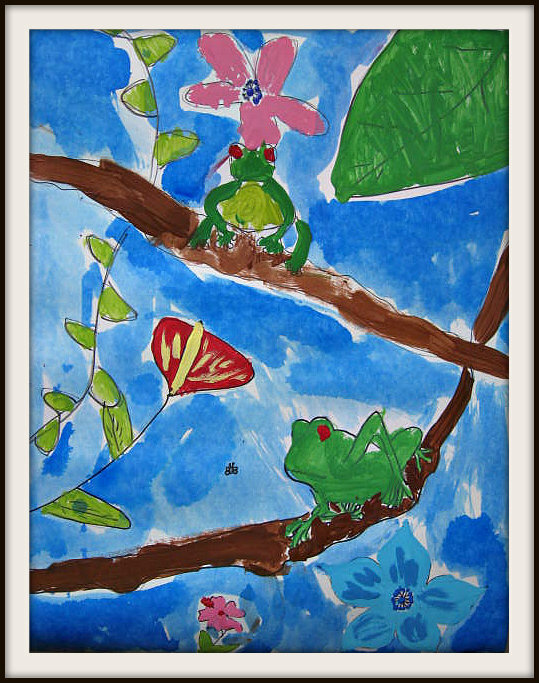 They created several frogs in different angles. 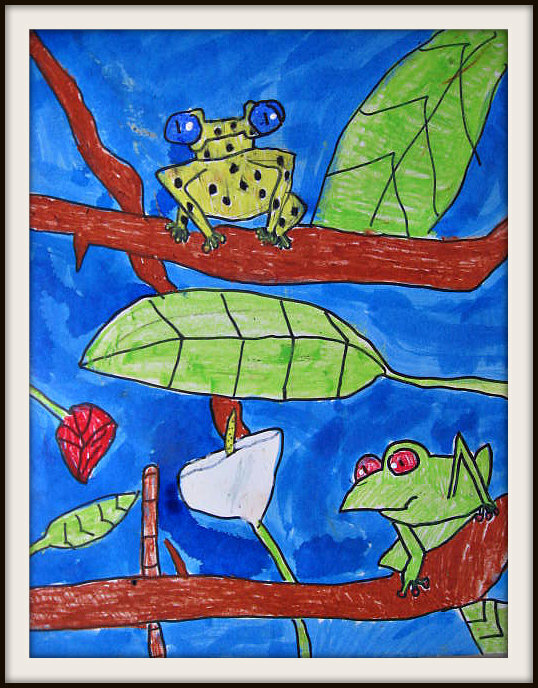 They were then encouraged to create a lush habitat, as if they had walked in the rain forest and taken a snap shot. 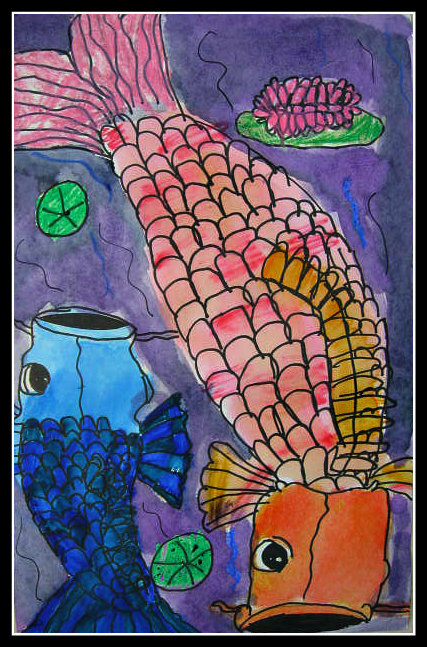 they had the option of using oil pastels, acrylics and watercolors to bring their paintings to life. Wonderful expressive lines and Fauvist colors Zoe! 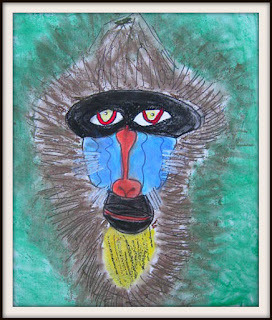 as well as the first time using chalk pastels. 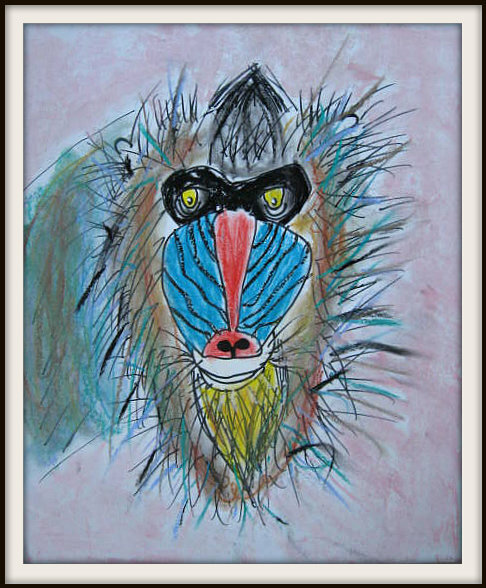 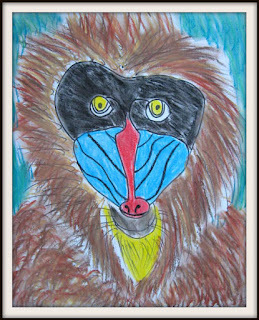 My K-4th grade group kicked off our Animals of the Rain forest and Desert class with these striking Mandrills in chalk pastel. We learned that they are the largest monkeys in the world and live in the rain forests of Africa. The mature males have the unmistakable colorful characteristics of the bright red nose and blue ridged cheeks. 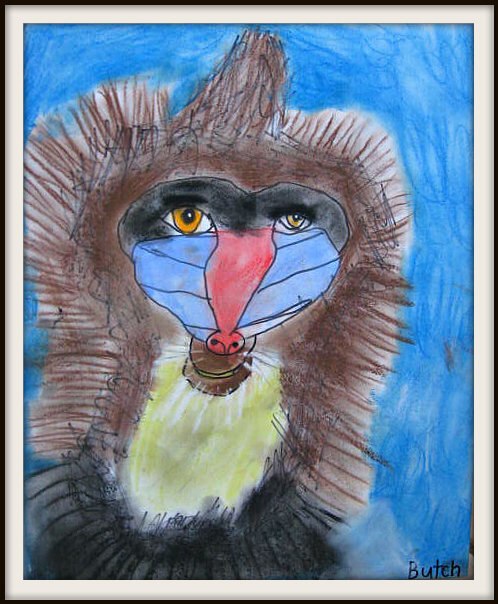 They also have enormous canine teeth that they like to show off (for whatever reason, this group preferred to draw them with closed mouths). 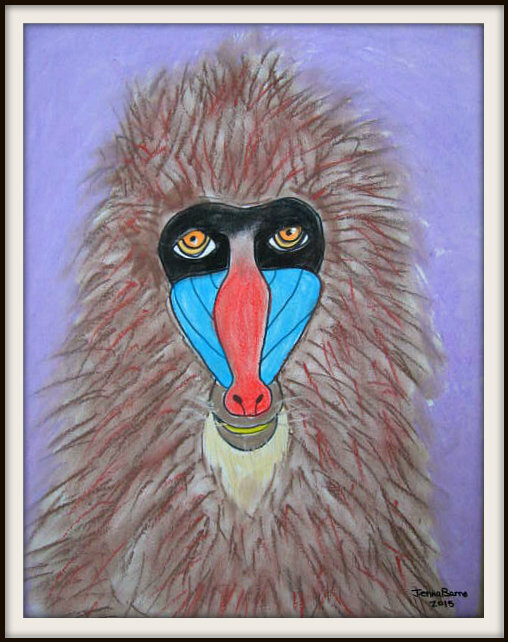 And while they look menacing, they are in fact quite shy. We followed a direct line drawing lesson starting with those mysterious deep set eyes. They were encouraged to use their pastels in a way to create the texture of fur, blending outward. 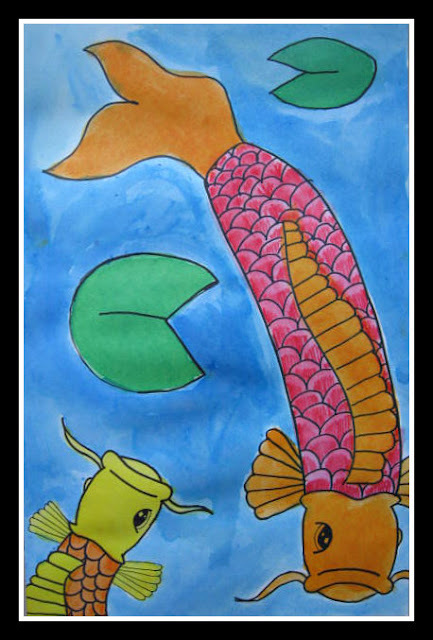 I think each has a very distinct personality. To create an interesting backdrop for our cat portraits the children chose 3-5 acrylic paint colors that were dripped and scraped on their board using thick card stock(credit or gift cards would be even better- but I'm lacking both ; ) ).You can find detailed directions and options Here. This is such a fun and addictive technique because results are so varied and it's both expressive and spontaneous. 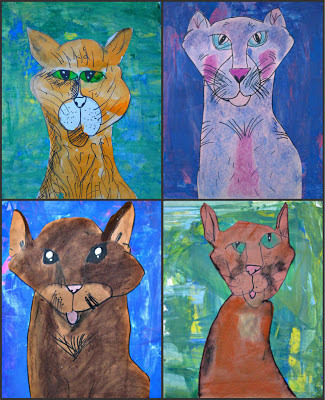 Next the children (K-3rd) chose their media and paper of choice to create their cat portrait. 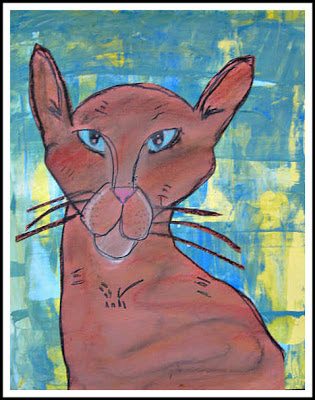 Their completed cats were then cut out and glued on their painted background. 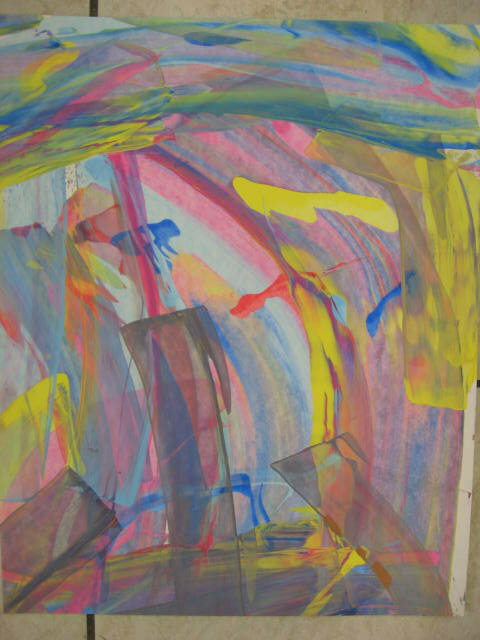 I will definitely be playing around with this technique in the future. I showed the children a few options for their cat and how they looked against the same background. Well, it was week 3 in my Wings, Fins and Fur class. 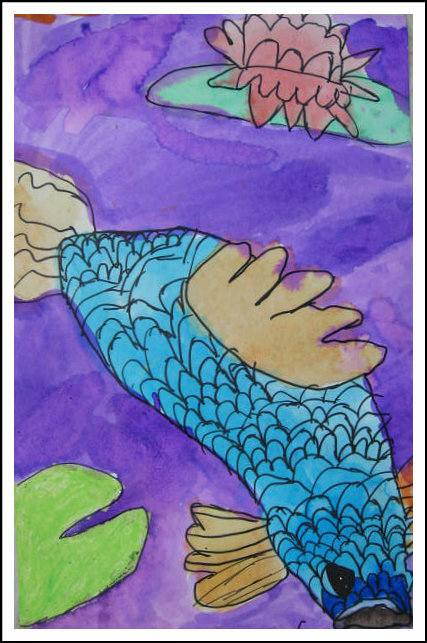 Wings - Tropical Birds (check), Fur - Raccoons (check) ....time for some "Fins." Thanks Natalie from smART Class for your great step-by-step tutorial for Koi Fish. 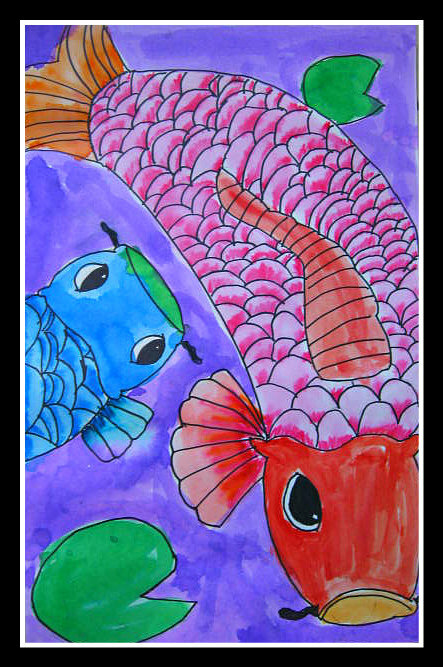 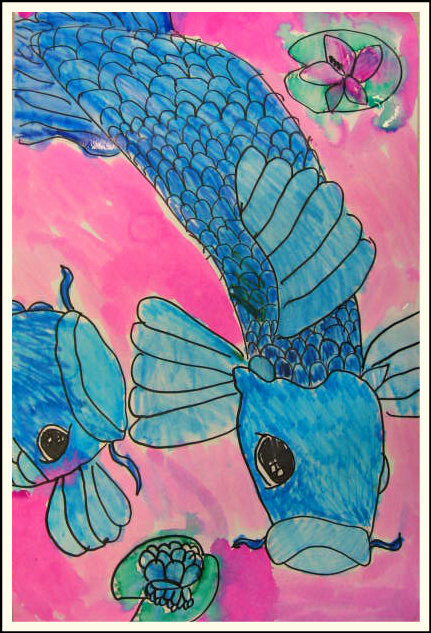 After their fish were "sharpied", the children had the option of using washable markers and water (a great idea from Natalie) for the scales or watercolor for their entire piece. 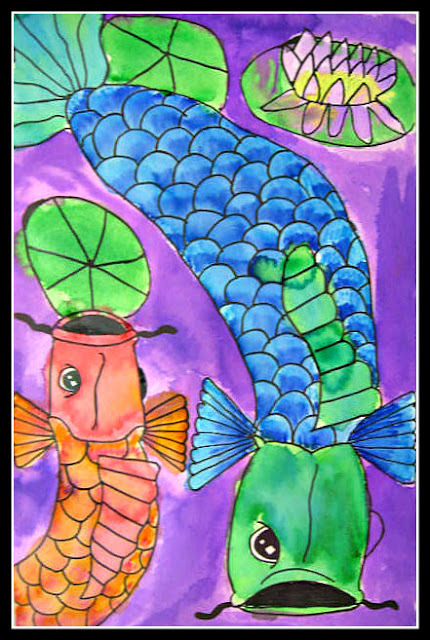 In thinking about composition, I encouraged them to fill up their space in a creative way (an extra cropped fish, lily pads going off the page ect..) The last step was to add liquid watercolor for the background. 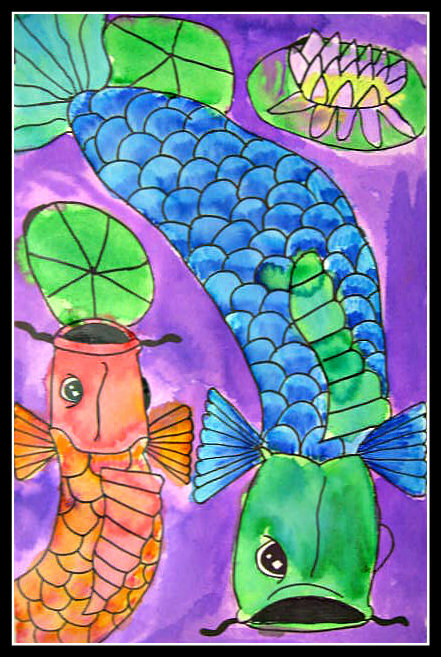 My K-4th group really enjoyed this lesson and were happy with their bold, colorful paintings. On Friday, I held a special 1-day mixed media class for children K-5th. 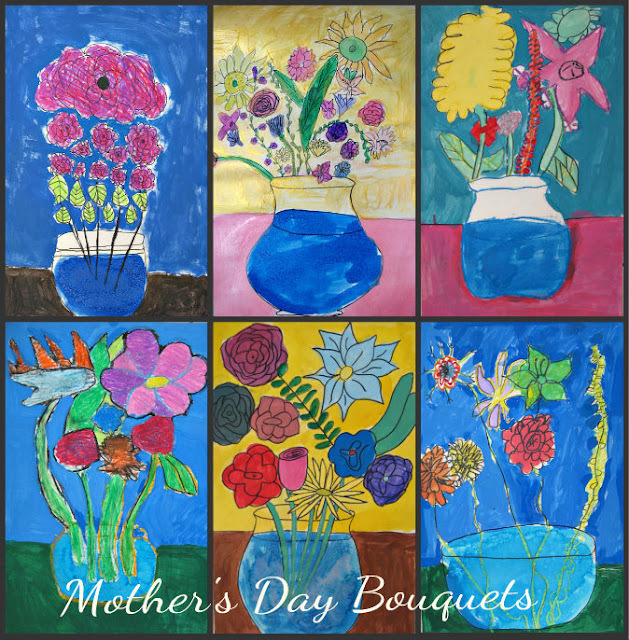 The children created floral bouquets in honor of Mother's Day. 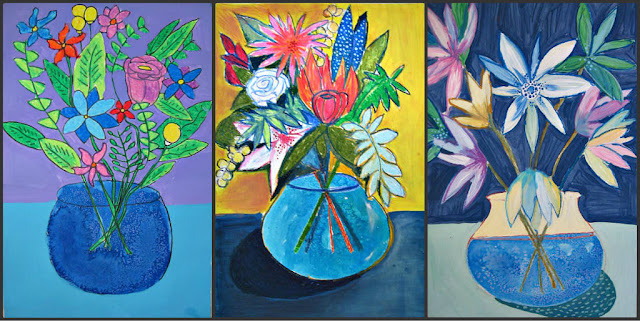 We looked at the floral still life work of one of my new favorites, Lulie Wallace.